Just like the Popiah that I've mention in my previous post, Ngoh Hiang (literally mean five fragrant) is another greatly under appreciated Singapore hawker food. There are many takes on this and even the Cantonese have their version which can be found in any dim sum restaurant. In Malaysia, this tasty meat rolls is known as Loh Bak (which mean marinated meat). 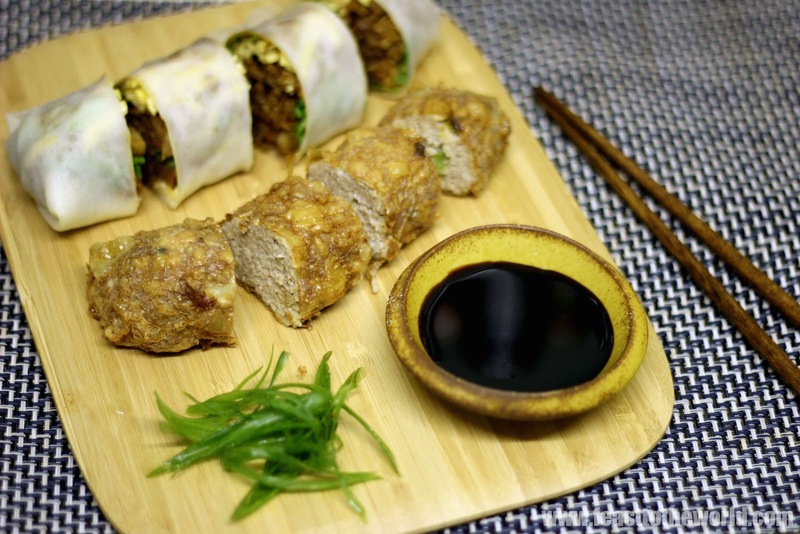 Ngoh Hiang is so named due to the usage of five spice seasoning that went into marinating the filling which give the meat roll its signature aromatic fragrance. However, these days it has also come to be used to describe a collective of fried snacks available in Singapore. Unlike the Teochew or Hokkien version, the Nyonya Ngor Hiang do not contain any yam or flour so it's packed full of meaty protein and less carb, so great news if you are on diet. That is if you ignore the lard that is presence in the recipe. My argument is that it does give it more flavour but of course you can always substitute it with a healthier sunflower oil. Just don't let my nan know about this. In Singapore, this dish is commonly found in hawker stalls that sell fried prawns fritters, egg rolls, liver roll etc and is usually served alongside with fried bee hoon (rice vermicelli) for breakfast. It is not that odd to have savoury stir fried noodles for brekkie in Singapore in case you are wondering. Very often, a bowl of sweet gooey sauce in the brightest hue of pink will also be dished up on the side for you to dip the crispy rolls in. However, for home consumption, my nan always served them with some sweet flour sauce (tee chew) or kecap manis and chilli sauce instead which in my eyes, are much nicer. And just for those of you who haven't read my last post......I have included another photo of my dinner on the night, the Yin-Yang Spring rolls - Popiah and Ngor Hiang both loving made and demolished with great gusto. So good! Mix all the ingredients for the filling in a large bowl thoroughly and set aside to marinade for 30 minutes. 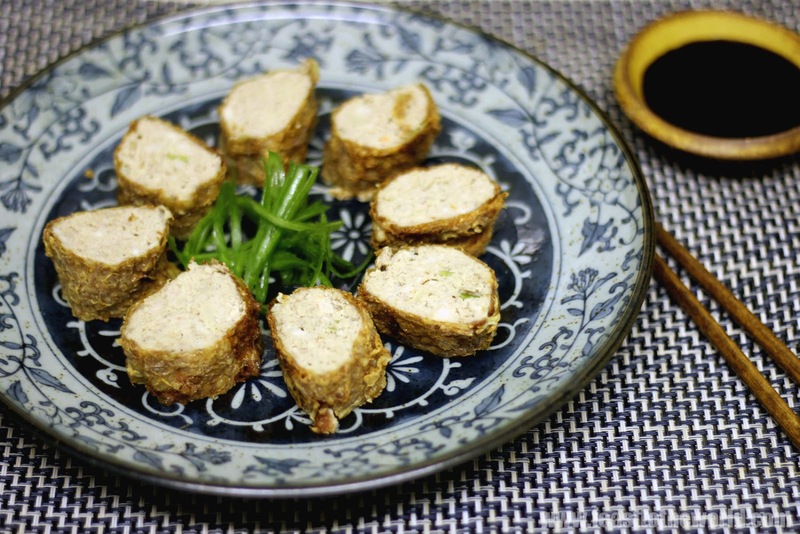 If using dried bean curd skin, reconstitute them by submerging it in a dish of warm water for 30 seconds. Remove and gently wipe dry with a kitchen towel. Cut the skin into rectangles 6in x 7 in (15cm x 18cm) and set aside. 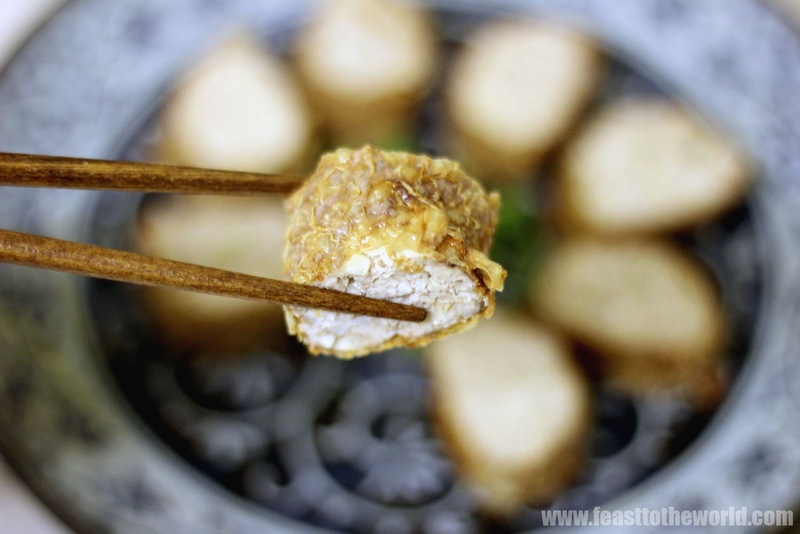 Lay the bean curd skin on a work surface. 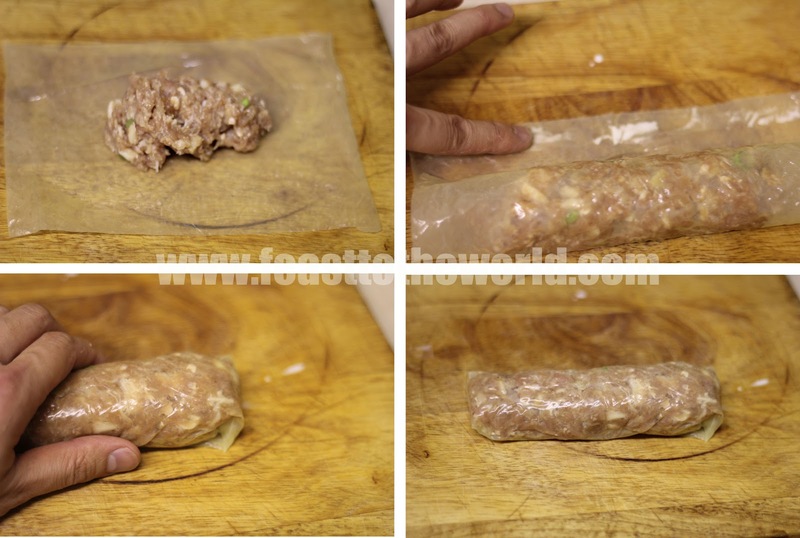 Place 3 tablespoon of filling along the length of the skin, leaving a small margins at each end. Roll the skin over to enclosed the filling, tucking in the ends as you go along to form a cigar shape. Smear a little corn flour paste along the seam and press to seal. Repeat with the remaining skins and filling. Place the rolls slightly apart in a lightly greased steamer and steam over simmering water for 10 minutes. Remove and transfer to a lightly oiled plate and leave to cool. 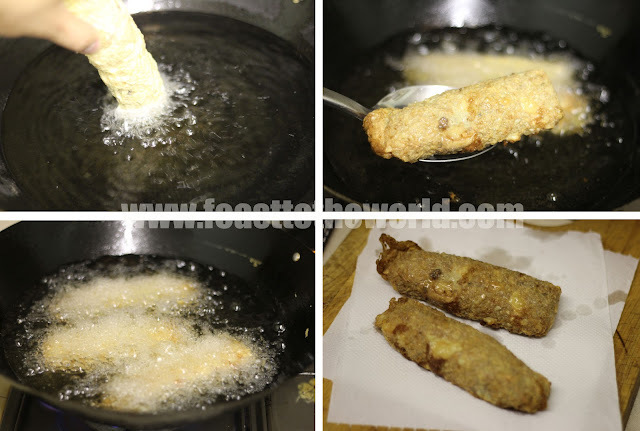 Heat the oil in a deep pan or wok until very hot, about 190ºC and deep fry the rolls 2-3 batches until golden brown and crispy. Remove and drain on paper towel. 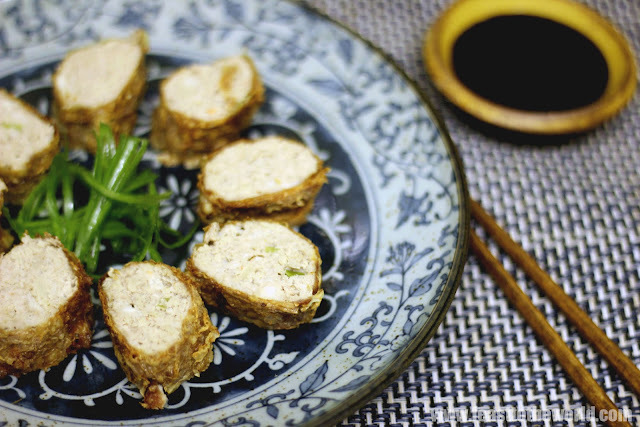 Slice into bite-size pieces and serve with the dipping sauce.